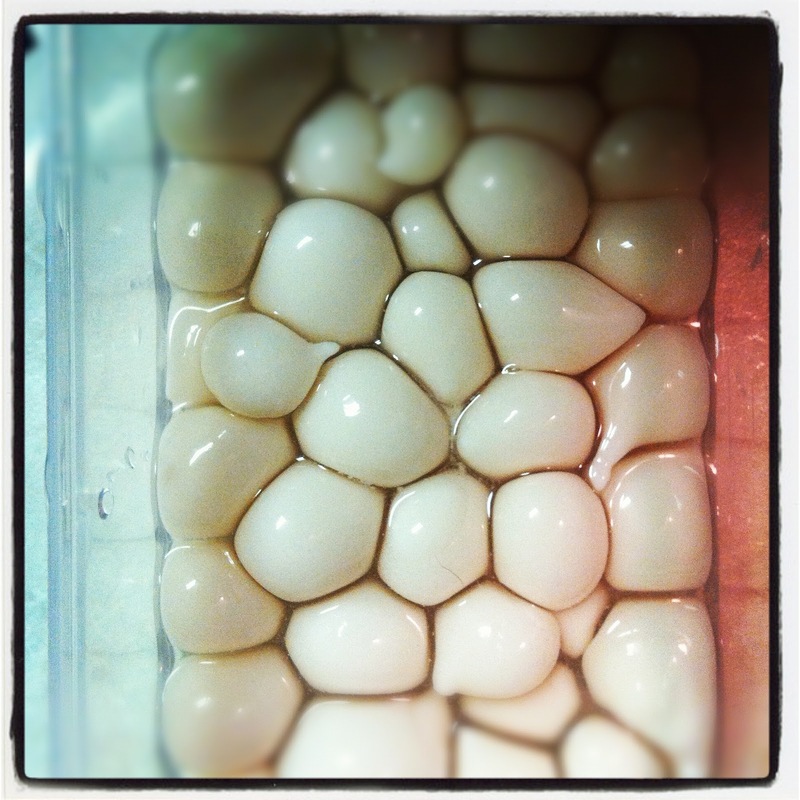 For Day Three of Thing A Day, I decided to continue on the road of spherification and attempt to make Yogurt Spheres. YOGURT SPHERES WERE A RAGING SUCCESS! Seriously, these should be marked #1 on the beginners scale, and they are a total bang for your buck. Cheap ingredients, very simple to make, and really cool looking. You may be getting used to this now, as an Alginate bath is the basic step for any spherification recipe. Add 1 packet (20g) of Sodium Alginate to two cups of water and mix with your immersion blender. Then, place in the fridge for fifteen minutes. Add 1/2 teaspoon Calcium Lactate to 2/3 cup of yogurt. I was heavy handed with the calcium lactate, as I think this may have been my issue yesterday. I also made sure to mix very thoroughly – if the additive is not mixed in properly, then it will not work well. Now that things were working properly, making the spheres was a cinch. I seriously had *none* of the problems that I had last time. When placed in the alginate bath, the yogurt stayed put. It didn’t matter if it had been in the bath 10 seconds or 3 minutes. As soon as it was dropped into the bath, it was like the yogurt immediately had a coating around it and it wasn’t leaking out everywhere like the custard did. Using a teaspoon, drop balls of yogurt into the alginate bath. Because of the”shell” around the yogurt, I didn’t have to worry about dropping them near each other and them sticking together. Once they had a few seconds to set, they didn’t attach to their neighboring spheres. The only thing to be careful about is as you drop them in. If you are a messy dropper or drop too slowly, two or more balls could form and stick together. Let the spheres sit in the bath for 3 minutes, then transfer to a bowl of water. Rinse (swirl the spoon around) and remove from the water. I did this in batches and probably had to clear out my alginate bath about 5 times to add more spheres in. I am not sure about storage, but I think these will be able to be stored in a normal tupperware container. I will let you know if I run into any problems, but here is the finished product. They are so awesome. You can pick each one up, roll it around, drop it into the water, and it won’t even break. One thing to be careful of is getting them out of this container though. I had to squeeze a bit and a few broke, so I would use a spoon to get them out of the container they reside in. 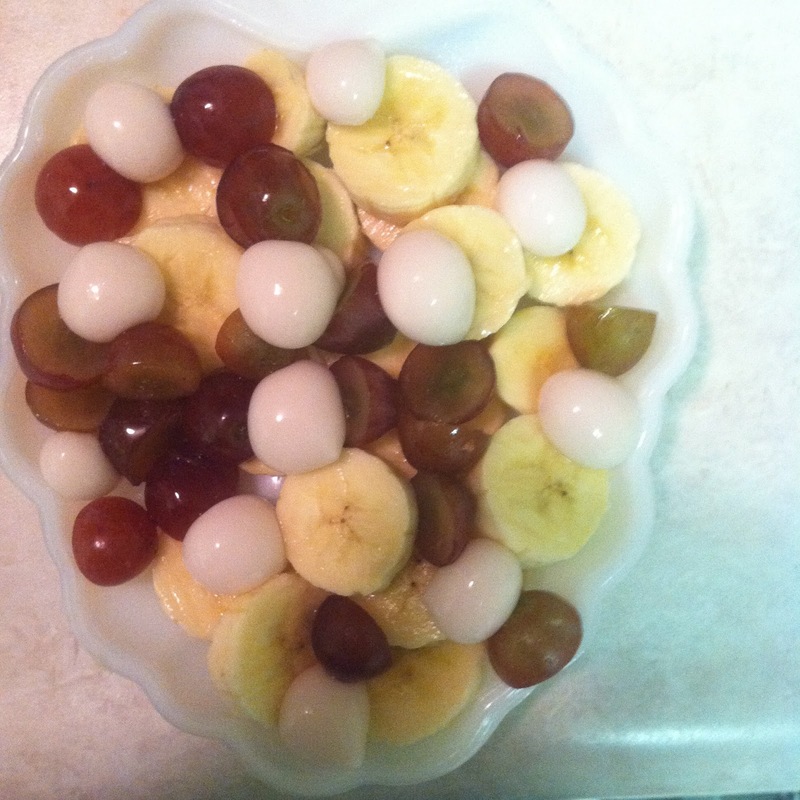 Here is how I ate my spheres, atop a delicious fruit salad. Another thing to note is the texture of these takes a bit of getting used to, if you are expecting to just pop them in your mouth. They taste fine, but there is a definite alginate coating that forms a shell around them. If you eat them in something like a fruit salad, granola, etc. they taste great and the shell isn’t even noticeable. Just wanted to provide some forewarning that it might take getting used to if you wanted to serve this solo.